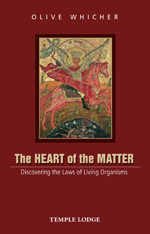 In this concise and richly-illustrated work, Olive Whicher introduces a radical new science of living organisms, forms and processes, based on the pioneering work of Rudolf Steiner and his pupil George Adams. If we are to understand fully the laws of living nature, she argues, it is necessary to overcome the one-sided ideas of modern science – ideas that are only adequate to describe material forms and forces. We need to widen our thinking to include the ‘etheric formative forces’ – forces that are alive in ethereal space or ‘counterspace’. Such forces work in plants, for example, by drawing matter upwards in a suctional manner, in contrast to the forces of gravity, which draw downwards, and the forces of an explosion, which work upward and outward. This easily-digestible introduction will be valuable to anybody seeking to comprehend the living world around us. OLIVE MARY WHICHER (1910-2006) was born in Winchester, England, and became fluent in French and German. She joined the Anthroposophical Society in 1935 in London, where she met George Adams. She worked as his research assistant in the fields of science, mathematics and physics, and has authored several books, including Projective Geometry, The Plant Between Sun and Earth and Sunspace. Olive Whicher taught for many years at Emerson College, Sussex, and lectured widely throughout Europe and the United States.